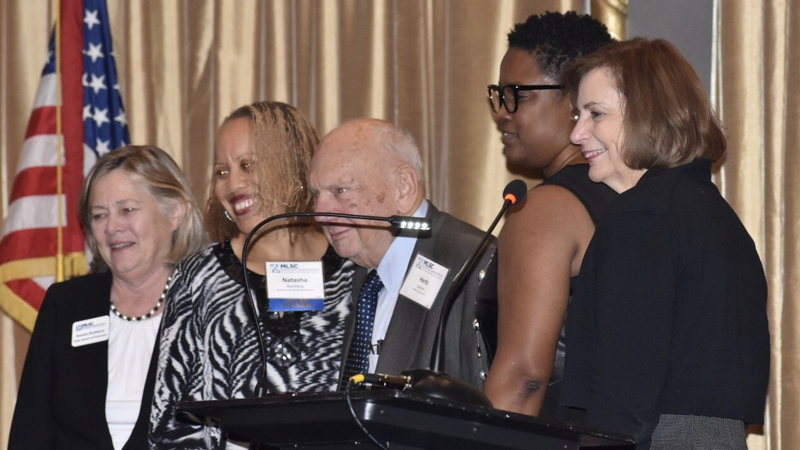 More than 200 attorneys and judges from around the state joined the Maryland Legal Service Corporation (MLSC) in honoring the recipients of its 2018 Annual Awards with a special reception held December 3 at the Lord Baltimore Hotel in downtown Baltimore. Established in 1982, MLSC raises funds and makes grants to nonprofit organizations for the provision of civil legal assistance to low-income Marylanders. Board Chair M. Natalie McSherry said that MLSC’s 35 grantees closed more than 202,000 cases in the past year, benefiting nearly 340,000 people. McSherry also recognized Erlichman, who this year marked 30 years of service to MLSC. MLSC is principally funded by Interest on Lawyer Trust Accounts (IOLTA) and surcharges on court filing fees. Title 19, Chapter 400, Rule 19-411 of the Maryland Attorneys’ Rules of Professional Conduct ensures that financial institutions that participate in the IOLTA program pay interest rates on IOLTA deposits that are comparable to other similarly situated accounts. In 2002, MLSC and the Maryland State Bar Association partnered to create the IOLTA Honor Roll, which encourages financial institutions to pay favorable interest rates to foster the IOLTA program in its mission to ensure that low-income Marylanders have access to critically needed legal aid. Click here for more information on the Honor Roll and its member institutions.